I have had this top for many years, and I believe it's one I purchased from Goodwill. I like thta's it's an off-white, and will go with so many other colors. The skirt was a gift from my mother, and I think it goes very well with this top. I had a hard time finding something to match until I came across the top in my closet. The necklace is one I bought from a dollar store while still living in Lancaster, CA. I thought it went very well with the orange in my skirt. I bought this beige, linen dress several months ago from Goodwill, and I thought it was perfect for the linen trend that is so popular this year. The label says it is a size 12, but I think it fits me very well, and the belt helps the fit a lot, too. I love the little details around the sleeves! 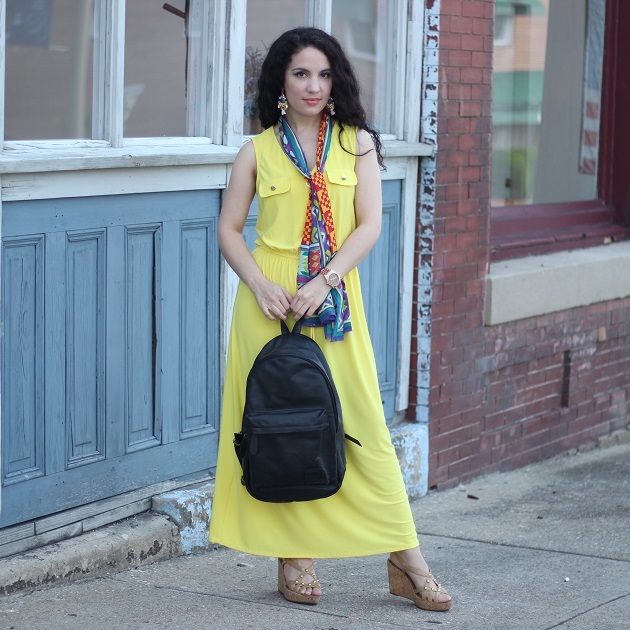 The bag I am wearing is also from Goodwill, and it was on sale for just $2! 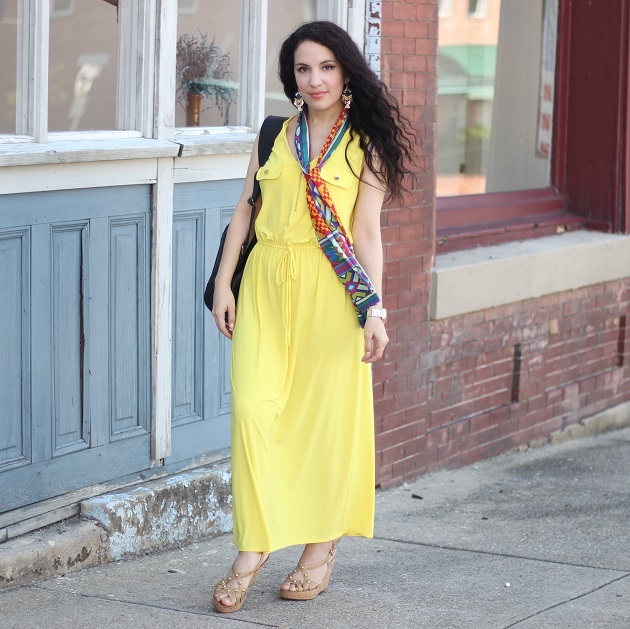 I thought this was also an item that is on trend, and I have already worn it several times since buying it since it goes with so many of my summer clothing items! The sandals are also from Goodwill! They are very comfortable, and go with most everything I have. Overall, I love the neutral look of this outfit. Let me know what you think! The top I am wearing was a gift from my mother. I am not sure what this fabric is alled, but it's the kind that stretches to many times in orginal size. I have a couple others from the same fabric, too. The skirt is one I have had for years. It was one of the items I left in Virginia when I moved to California. I bought it from Goodwill. The shoes are also from Goodwill, and I just picked them up about a week ago. I thought the neutral tones would go with a lot of diffeent colors. I am once again wearing my new MVMT sunglasses. I love how they also go with so many different things! Remember you can Use code libertadgreen15 for $15 off your purchase! I love the look of my new MVMT sunglasses, and watch. I have been wanting a marble-faced watch for a while now, so I was very happy when I had the chance to review one for MVMT. I chose the marble with a rose-gold band. The packaging is gorgeous for their products, making them especially great to give as gifts. I lvoe the print of the sunglasses! I have also been wanting some in this style for a while now, too. I love the colors, because I think these will look good in every season. The cat-eye style is also a classic. Use code libertadgreen15 for $15 off your purchase! I had so much fun putting this outfit together! My favorite piece is the hat, because it was on sale fro just $1 at Roses! I love all the pearls! The huge necklace is one Vaughan insisted I buy, he thought it was just too much fun. They are so over-the-top! The bag is the most expensive item, it was about $20 from Ross. I was so happy to find it. I have been wanting something like it all year since I started seeing the pearl bag trend online. These adorable pants were $12.50 from Family Dollar. I still can't belive they carry such cool fashion items! The slides are also frm Roses, and they were about $7. I had been wanting pearl detail shoes all year, too! I bought them in several other colors. If you are having trouble finding the best curling iron for you, then this article is for you. 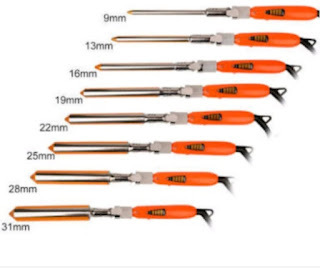 We have different curling irons to produce different sizes of curls. The different types of curls you can get from different curling irons make it important to choose the perfect curling irons according to the type of hair being curled. The top curling irons for different girls are of different types. In order to select the best curls for different girls we should consider certain factors. Decide on the type of curls you want to achieve. Different types of curling irons have different barrels based on the size of curls that they are intended to form. The top curling irons for girls in the market can help you produce different types and sizes of curls. If you want a tight curl, pick a curling iron with a smaller diameter, and if you want a bigger curl, choose one with a larger diameter. When selecting a curling iron that will give your hair the best look and shape, you should also consider the texture of your hair and its thickness.If you have short hair, which extends to just above your shoulder, a small barrel will be the most appropriate. 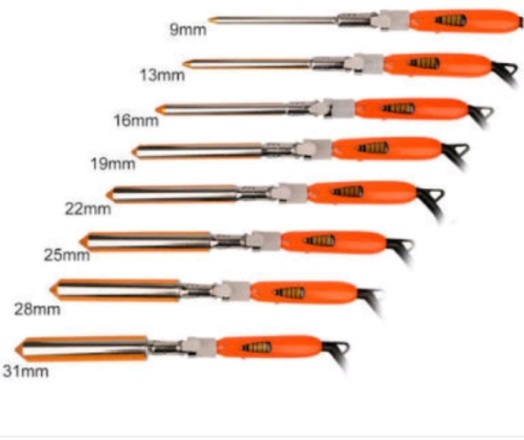 Decide on the heating capacity of the curling iron you want. Take note of all the features of the curling iron you want to purchase. One thing to consider is the heat settings. A top curling iron will have a wide variety of heat settings, and this will make the curling iron easier to control. A curling iron without a variety of heat settings is less likely to give you the best results when curling your hair. Choose a curlig iron with a spring-loaded clamp. Another thing to take note of is the spring-loaded clamp. A curling iron with a spring-loaded clamp will hold your hair in place while you curl it. 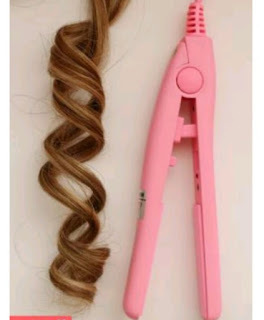 This will make it easier to curl, and will make using the curling iron easier. Choose a curling iron with the shape you want. Consider the shape of the iron. Curling irons come in a variety of shapes which will lead to different results. 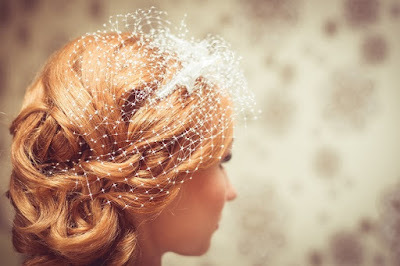 You should get the curling iron which has the barrel which can provide you with the best curl shape and size possible. We have curling irons with straight barrels, spiral barrels, pearl barrels, double or triple barrels, and flat irons. Choose a curling iron of the right material. Curling irons are made from different materials which have different effects on the hair they are applied to. 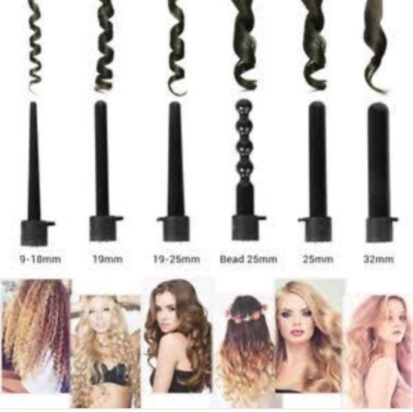 The different materials heat differently and curl the hair differently. Before purchasing a curling iron, be sure to choose one made of the right material. Materials used in making curling irons include ceramic, tourmaline, titanium, and chrome, as well as gold and other types of metal. My family and I celebrated National banana Split Day, today, how about you? I had fun, but I am not sure I will want ice cream again anytime soon. Then again, ask me tomorrow, and I will have probably already had more for breakfast. This dress is another one that I bought from Fallas while in California. The earrings came from Goodwill several months ago. I love the tone of gold they are in. I thought they went very well with the dress. Here is an adorable Green nautical women mini dress that is kind of similar to mine, but short! I put the finishing touches on my living room today, so I hope to film a room tour tomorrow! There are still things that need to be completed in the future, but it is mostly done now. My family and I did a little thrift shoppping today, and I picked up a few cute pieces. More haul videos to come! The top and skirt I am wearing were purchased at different times, but they go together like a set! The pink bag was a fairly recent purchase from Goodwill. The zipper pull broke after my first time using it, bt I was able to slip another pull on and fit it! It's a cute bag, and very on trend right now. I paid less than $4 for this one. I have been enjoying the cooler temperatures! I guess this is a taste of fall! I am not ready for it to be fall yet, though! I was actually cold this monring! It was a little hard to know how to dress today, so I opted for arobe-like jacket over a mini dress. The look is from a few weeks ago. I found this dress on sale for one doallr at Goodwill. I am wearing a necklace I got on sale at Walmart a few years ago. I though it matched very well! I had this skirt for a long time, and I had trouble finding a top that would match it. I finally bought this pink swimsuit top, and I think it goes perfectly! Because the skirt can be worn high-wasited, I don't fel uncomfortable in this shorter top. The denim jacket is vintage, I think from the early 1990's. It's back is mesh! I am wearing my favorite, goldish/beige flip flops that were only $3.99 from Roses. Family Dollar is not the first place I think of when I think of fashion, but since finding these pants there, that may change! I was so happy to find these, and a pink pair, for just $12.50! The quality is great, too! I bought these a month or so ago, so I am not sure they still have them in stock, but you should check out Family Dollar, anyway, and see if they have anything you would be interested in. These pants zip up the front, and also have a tie belt, and pockets on each side. I was thrilled that they did not need hemming to fit me! The only thing I would change is to make the waist a little higher. I did a little shopping at Roses today, and found some cute bags and acccessories that were on clearance. I'll be doing a haul video, so stay tuned to my Youtube channel. The dress I am wearing is one I found at a little shop in Keysville, Virginia. I am wearing a black lace "jacket that I either got from Amazon, or a Goodwill store. I can't remember for sure because I have another similar. The green heels are a Goodwill find. The necklace is one I found from Lowemart. The backdrop is a store front in Alberta, Virginia. It is so cute, I just had to take a photo there! The top I am wearing is something I bought a few years ago from a thrift store. I am actually wearing it backwards, because I think the lace detail is so pretty! The blye crochet skirt is from Roses, and was only $3! I thought it went well with the top, and the earrings, which I bought for just $1 at one of my favorite thrift shops. They were brand new, though! It's another hot, and very sunny day here in Virginia. I am looking forward to the cooler temps we are expecting next week. Are you really for fall? I have been hearing so much talk about it, but I still want to enjoy summer while I can. Besides, I have way too many cute summer clothes I have yet to even wear! It can't be fall just yet! I bought this dress and bag at different times, but I think it's so cool how well they go together! The dress is one I bought from Fallas while living in California. The bag is something I bought from a thrift store. I also love how I match there beautiful flowers! Today, we went shopping and had Brunswick stew while we were out. I love Brunswick stew! Have you ever had it? Is so, are you a fan as well? 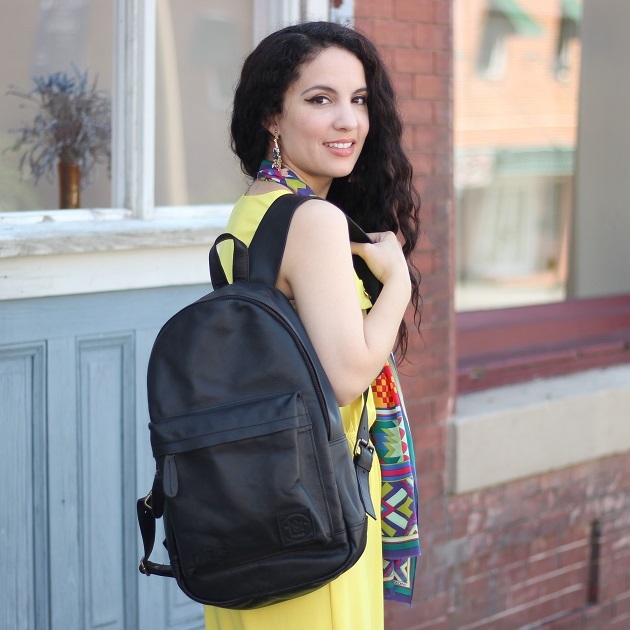 Today I am reviewing this black leather backpack from MAHI Leather. 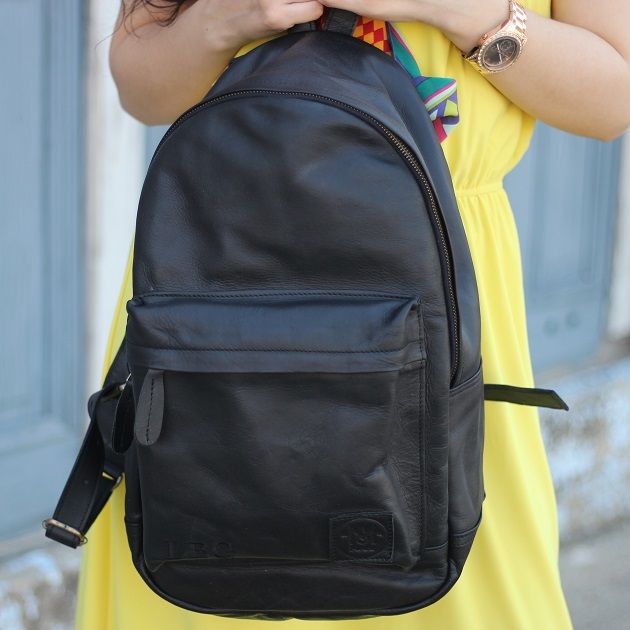 Since my first time flying years ago, I have been wanting the perfect, solid black, leather backpack for travel. I learned that one backpack and one piece of rolling luggage is all you need for almost any trip. This bag is made of thick, quality leather that I am sure will last for many, many years. The size is great, as well. I am so happy with how much it holds! I could see using this for an overnight bag, easily. The straps are adjustable, and wide, for support and comfort. There is a pouch zip pocket on the outside, a small zip pocket in the main compartment, and two small open pockets inside, as well. The backpack also came with it's own dust bag. 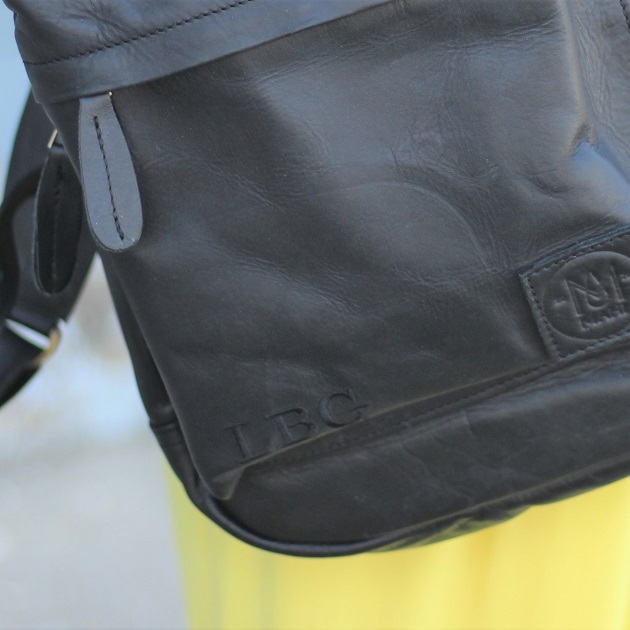 You can get your initials in black, grey or white. I chose mine (LBG) in black for an understated look. If black leather is not your thing, this stye of bag also comes in brown. Personally, I love the black. I adore the fact that it will look great with pretty much all my other luggage, bags, and clothing. *Thank you to MAHI leather for sponsoring this post.